Getting ready for Christmas the whole year round… Santa’s got only one night to travel through the sky all over the world to carry the presents. Whew! What a sweaty piece of work the main WINTER wishMASTER has! But who else but he can succeed in this MAGIC business and… Bring joy to every house? So that all the people can have a GREAT MONEY time during Happy Holidays slots and stick it in memory forEVER with 243 ways to win! You will see that it can start to come true at once thanks to the spins giving you the scatter prize of $15,000 as well as the highest jolly jackpot of $7,500. 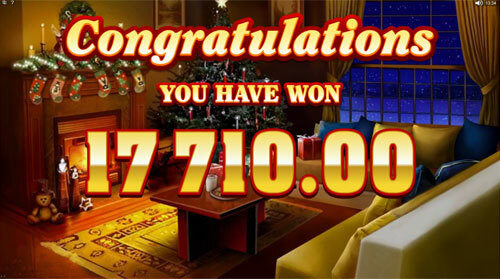 Is your reel stocking hanging from the mantelpiece big enough to get these IMPRESSive cash gifts inside? 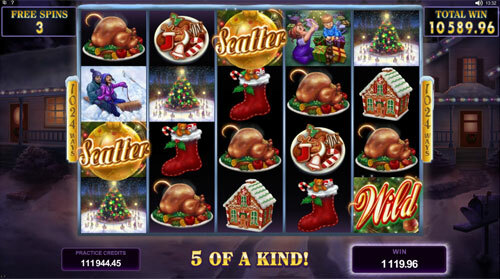 By the way, if you’re well-behaved… 10 Free Spins or the Frosty Feature may be your festive SURPRISE this time! But finding piles of lovely presents under your Xmas tree, you’ll easily distinguish the ones brought by Father Frost as they are marked by the bright stamps with Happy Holidays Logos. Representing wild symbols at the same time, they can replace other slots images apart from the scatters and Snowman pictures on the chilling reels and… Lift your spirits by the additional WONDERful rewards including the top fabulous jackpot of 15,000 coins for 5 wilds. By the way, is your fir beauty trimmed with the garlands and other decorations yet? Well, why not add some sparkling Gold Baubles? It will look much magnetic and winning with these scattered Christmas symbols then. Besides that, at least 3 of them can trigger the Free Spins Feature going with 1,024 ways to win! And in case of placing 5 Gold Baubles at the TOP… It’s a brilliant chance to receive up to 30,000 coins! Santa’s generosity seems to know no bounds. Nevertheless, gaining a reputation of a mean guy like the wicked oldster from Scrooge slot machine, you’ll get the coal instead of the splendid gifts. So… It’s better to play for real proceeding from the stakes with the minimum of $0.30 and the maximum equal to $150. You’re able to vary the bets using such coin sizes as $0.01, $0.02, $0.05, $0.10, $0.20, $0.25 and $0.50. How about giving a really WARM welcome to our pastry-lover? Just leave milk and cookies for him on the windowsill along with the stake of 300 coins or $150 and… Any minute you can notice 5 Happy Holidays Logos that ensure the most freezing jackpot of 15,000 coins or $7,500 and respectively… The fat purse next year! Glance out of the gambling window. It’s snowing at last! Yippee! Christmas MIRACLE, isn’t it? Hm, this probably hasn’t been without Santy’s spell and therefore… You can guess that the fairy sleigh loaded with present boxes is getting closer and closer to you. So, very soon the Free Spins Bonus can be passed through the chimney and activated as soon as 3, 4 or 5 scattered balls appear on the branches of the tree! You’ll have 10 Free Spins at 1,024 ways to reap the celebratory benefit. Moreover, fond of making a Snowman? This PRIZE winter you can find it transforming into other symbols within this bonus game. To offer you the largest rewards ever. 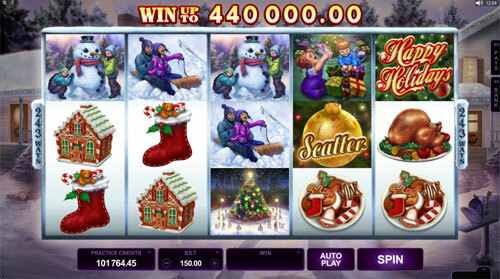 Up to 880,000 coins or $440,000 can come to your hands just in the twinkling of the lights! Hey, can you feel the crisp air outside the reels that are covered with the ice tracery? Those are the COOL tricks of the Frosty Feature! Nipping you at your cheeks at random, it will please you by the chizzy money bestowals for some images hit! Hardly you behold just 1 scatter symbol among other ones when you are carried into the Free Spins. May this bonus journey be embedded in your memory with its AVALANCHE wins! According to a superstition, GOOD LUCK will come to the home where a fire is kept burning throughout the Christmas season. 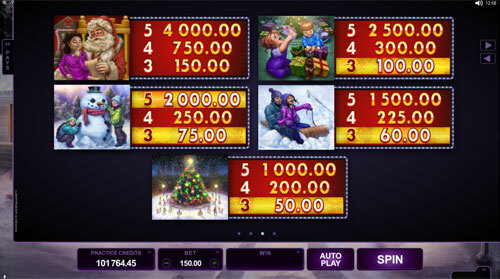 That’s why, make yourself comfortable at the hearth-side and… Take a cash-RICH pleasure in Happy Holidays slot machine full of prize moments and bonus advents!